G2G door seals provide a solution for perimeter and threshold sealing of glass doors. The door system has been designed to work in conjunction with the G2G dry joint range to provide a sleek and minimal finish to enhance the overall aesthetics of fully glazed partitions. G2G Door Seals are suitable for use in 10 and 12mm glass doors which are single action and open inwards. The G2G door seal truly fills the gap present in the partitioning industry and has been designed to complement the G2G dry joint range, providing a sleek and minimal finish to enhance the overall aesthetics and functionality of internal glass partitions incorporating glass doors. 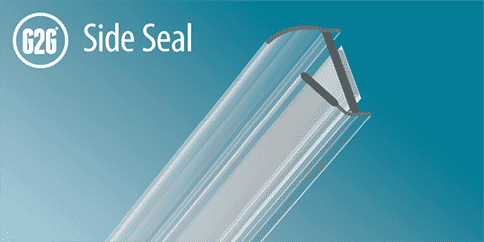 The G2G glass door seal is a two part system comprising of a Top and Bottom Seal and a Side Seal both of which can be shaped onsite to accommodate various manufacturers’ hardware. The Seals combine rigid and flexible elements to ensure the opening and closing of the door is not compromised, whilst at the same time maintaining the low profile and high clarity associated with G2G. Our system is suitable for use on single doors with standard (10 and 12mm) and laminated (10.8 and 12.8mm) glass types, the seals have a high bond adhesive tape for ease of application and to prevent delamination under normal conditions of use. 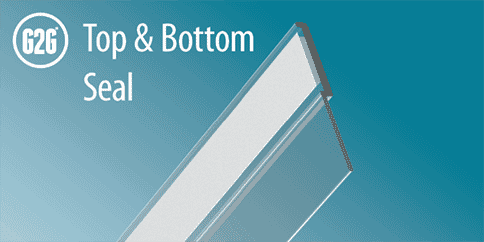 The inter-changeability between the Top and Bottom Seal and a Side Seal allows configurations that can accommodate solid and glazed over panels. For further information on the complete G2G range of frameless partitioning products click here, or view the G2G Door Seals here. Reddiplex Glazing Gaskets Are you using a black frameless glass partitioning system?